The KUA Wildcats faced off against the New Hampton Huskies under sunny skies on Brewster Field. The Wildcats were determined to put a show on for the home crowd, and what a game it was. Freshman striker Lily Wennik led off the scoring with a solid goal early in the first half, with an assist from midfielder Helena Heckmann. In the midfield, Lexy Gray boxed out the Huskies’ defenders, while Sofia Garner and Margot Frost deftly worked the ball through to the strikers. 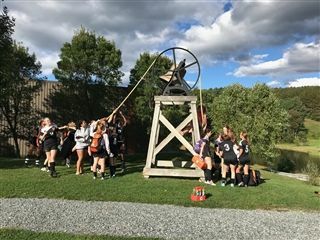 The New Hampton midfield tested the KUA defense, but KUA’s fullback line was solid with Winsome Neville, Nikki Petrescu-Boboc, Kate Rybakova and Brianna Angelli holding down the wings. Kate Mackey and Hailey McNamara were stalwarts as stopper and sweeper, both playing nearly the whole game. Indigo Kopp was a wall in net with over four saves against a tenacious Huskie offensive line. Towards the end of the half, captains Molly Beaupre and Maddy Haynes got three goals. The Wildcats led 4-0 at the half. In the second half, Maddy Haynes came out on fire and got another goal for the hat-trick. Sophomore Ellie Stedina worked her way through the Huskie defenders and landed a goal. Midfielder Catie Flynn had an epic cross from the right side, which was then fired into the net by Caroline Sheehan. In the end, the Wildcats swept with a 7-0 victory over the Huskies and the whole team rang the Bell. Thank you, fans, for helping cheer on the JV Girls team to a great win. See you next match home against St. Paul’s School on Wednesday 10/3 @2:00 pm.